The 45th & the current President of the United States is Donald Trump. He is one of the best known and most controversial businessmen of the 1980s and 1990s. He is a well-known American businessman and real estate, developer. Donald Trump was born on 14th June 1946 in Queens, New York City, and the fourth of five children of Mr. Frederick C. and Mrs. Mary Macleod Trump. His father Frederick Trump was a builder and real estate developer. Donald Trump was a bright student since the beginning and was very energetic. At the age of 13, his parents sent him to the New York Military Academy. Finally, he graduated in 1964. He further studied at Fordham University and then at Wharton School of Finance at the University of Pennsylvania, from where he graduated in 1968 with a degree in economics. He has three children with his first wife Ivana Trump and one child with second wife Marla Maples and one child with his third wife Melania Trump. He also produced and hosted reality television series, “The Apprentice (2004)”, which has been nominated for 9 Primetime Emmy Awards. From 1971, he was chairman of his family real estate company, Elizabeth Trump & Son (The Trump Organization), which was founded in 1923 by his grandparents. His business focused on building or renovating office towers, casinos, hotels, and golf courses. Donald Trump entered Presidential Race in 2016 as a Republican and defeated 16 opponents. Trump was elected president in a surprise victory over Democratic nominee Hillary Clinton. Trump has signaled his intention to run for a second term 2020 Presidential campaign. Mr. President Donald Trump won a historic victory in 2016 America’s Presidential Election. His personality speaks millions of words about his dedication and determination. He emerged as an American entrepreneur, businessman, and a successful TV Personality. His words proved to the world no matter what, he walks in tide towards success. His victory and success in spite of conflicts is an inspiration and motivation for millions of people. His words take us to the close insight of his mind. 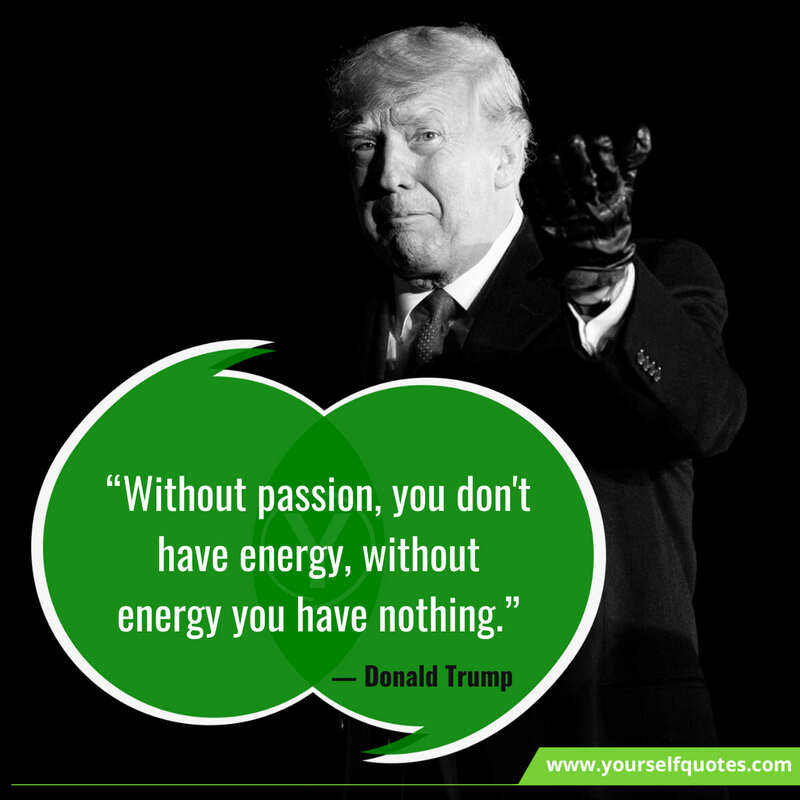 Now it’s your turn to share out these amazing inspirational Quotes by Donald Trump with your family & friends.